Mona McBride, 80, of Salado went to be with the Lord on May 21, 2018. She was born January 18, 1938 to Evelyn McKinney at a plantation near Marked Tree, Arkansas. 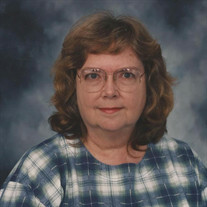 Mona was a member and retired Bookkeeper for Salado Baptist Church. She also retired as Treasurer and Bookkeeper for Southside School District after working 32 years. She enjoyed hunting, fishing, camping, reading, and traveling with family and friends. She is preceded in death by her husband, Delvia McBride of 63 years, two granddaughters Allison and Karen McBride, a brother Howard McKinney and sister Mavis McKinney. She is survived by a sister, Myra Mathis of Salado, a brother David McKinney of Memphis, TN, two sons Robert (Donna) McBride and Stephen (Teresa) McBride, two granddaughters Robin McBride, Christal Reyes (Carlos), six great grandchildren, Cordell Lopez, Ana Lopez, Chance Lopez, Josiah Reyes, London Reyes, and Bethany Reyes. Numerous nieces and nephews as well as honorary grandchildren, Samantha and Samuel Reyes. Visitation will be Wednesday, May 23rd from 6-8 PM at the Willis Funeral Service Chapel. Funeral service will be Thursday, May 24th at 2 PM at the Salado Baptist Church. Burial will follow at the Egner Cemetery in Salado under the direction of Willis Funeral Service.